We have fallen into somewhat of a routine. The boys seem happy. I’m glad about that. We were worried that since this was their first long visit, they would be uncomfortable and have homesick issues. But, so far so good. The weather on Tuesday started out looking iffy. There were heavy low clouds. The air was oppressive. I decided that I would take the kids to the craft store to get paint for their pine cones. Apparently, Ross decided this would be a good rainy day activity for them. I also wanted to treat each of them to a new pair of sneakers, and then stop at “Five Below”. They carry all kinds of stuff priced at under $5.00. I thought they could find pool/beach type toys there. Okay, I will admit it. The shopping trip was exhausting for me. It’s been a long while since I have had to get little kids in and out of car seats. Climbing in the back seat, trying to get the seat buckle in, making sure everything is secure may be easy for young parents, but let me tell you, it was a chore for this grandma. They know how to unbuckle themselves and get out of the car. As soon as I stopped the car, one kid would go out one door, the other out the opposite door. Then I would frantically try to gather them both together to make sure they didn’t go running out into the lot while someone was pulling in or out of their parking space. So by the end of the trip, Ty had gotten his finger caught in the door latch, I started to drive away with my hatch back door open and I ran up and over a curb. Crunch! In the afternoon the clouds disappeared and we were able to spend a couple of hours at the pool. As I was sitting on the edge of the pool, (Ross was in the pool with the kids) I began to notice how all of the grandparents were chanting the same cheers. Well, who knows maybe that kid will be the first one to learn to swim. Tough love? We spent Wednesday at the pool again. 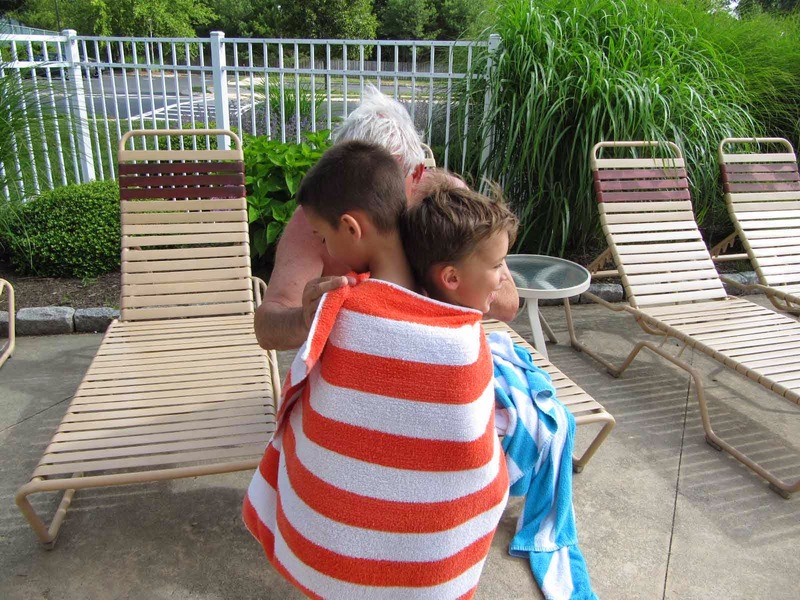 When the kids get out of the pool now, they want Pop-pop to “make me a mummy.” It has become part of the routine. Hard as they tried, the kids could not stay awake to greet their father Tuesday or Wednesday night. They fell asleep on the floor, side by side, with pillows under their heads, and wrapped in an afghan. When Jimmy got home, he picked them up, cradled them in his arms and carried them into their beds. Yes, it is a fun and precious time. I bet you sleep good at the end of the day keeping up with them! I'm glad all are enjoying the time together! Yes, that’s one true fact, we all sleep quite soundly. Playing in the pool really wears kids out! I don’t know where their energy comes from. But, interestingly enough, I seem to have more energy also. That's great! I'm so glad you're having such a wonderful visit!